DALLAS — Dirk Nowitzki will take the floor in Phoenix for the opener of his 18th season with Dallas and say hello to beloved former teammate Tyson Chandler. The Mavericks superstar has done this before, after winning the franchise’s only championship with Chandler in 2011 and watching him move on to the New York Knicks. 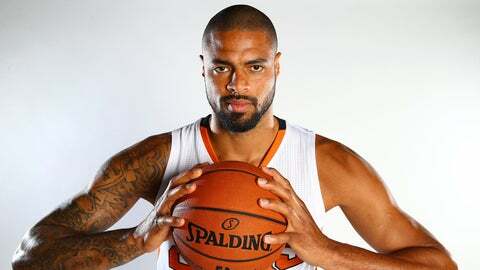 The circumstances are just about as difficult this time, since Chandler came back to Dallas for a season in a trade but quickly signed with the Suns in free agency before the Mavericks’ ill-fated pursuit of DeAndre Jordan ended with him reneging on a promise to sign and staying with the Los Angeles Clippers. "He’s going to be fired up. That’s Tyson," Nowitzki said of Wednesday’s opener. "But so is everybody else. This is the season opener. For them it’s the home opener. Everybody’s going to be juiced up." Dallas finally gets to put a disheartening summer to rest after the Jordan reversal, but faces the difficult task of competing in the Western Conference with another retooled roster that is only now getting everybody on the court together while still missing Chandler Parsons. Deron Williams is playing for his hometown team three years after spurning the Mavericks in free agency to stay with the Nets for the move from New Jersey to Brooklyn. The point guard didn’t make his Dallas debut until doing so alongside new shooting guard Wesley Matthews in the final preseason game Friday against Chicago in Lincoln, Nebraska. Williams battled calf issues in camp, a chronic problem for him. And Matthews is returning sooner than expected after tearing an Achilles tendon against the Mavericks when he was with Portland last March. "It’s difficult, but we’re veteran guys who had a lot of years in this league," Williams said. "Hopefully it will take less of an adjustment period. I feel like we have a great chemistry already in just the couple of practices we’ve had together as a whole." Point guard Brandon Knight starts his first full season in Phoenix after he was part of a busy trade deadline last season that sent Goran Dragic and Isaiah Thomas elsewhere. Those deals came during a disappointing year after the Suns were one of the surprises in 2013-14 and almost ended what is now a five-year playoff drought. In addition to rebounding and defense, Chandler was brought in for leadership with a mostly young roster. "Having a young team can have some benefits as far as athleticism, endurance, being able to get up and down the court," Chandler said. "With our depth, I feel like we’ve got to come at teams in waves." As training camp wrapped up, the Mavericks faced the possibility of three starters being sidelined in Williams, Matthews and Parsons. But now Parsons is the only one missing, and there is no timetable for his debut coming off surgery on a right knee issue that sidelined him for all but one game in a five-game, first-round playoff loss to Houston last season. "It’s not going to be something where we say, one day, we’re healthy and we don’t have to work with it anymore," said Rick Carlisle, who needs two wins to surpass Don Nelson as the winningest coach in franchise history. "It’s going to be a daily ritual. Guys that are in the process of coming back, are back, you name it, it’s all going to be live all year long." It won’t be easy in a conference that might require 50 wins to make the playoffs. "The West is tough," said Williams, who spent his first five-plus seasons with Utah. "But I feel like my game is suited for the West. This is where I learned to play was in the West, that up-tempo style." And now Chandler is a West rival for Dallas.